Here is some news written by our friends Lesley and Steve Hooper who visited during September. It was immediately obvious that some of the children were at least understanding more spoken English and some were noticeably more fluent so I say a big ‘thank you’ on behalf of the children who have benefited. For more information on Musicians without Borders go to their Website or or find them on facebook. Our mission this time was spoken English with P4 and P5 children. In their normal classes, there are just so many children that it is very difficult to have time to practise the English they learn. Lots of repeating words and phrases takes place, along with reading and writing so the children learn much. Meg Foundation has many lovely books, games, resources so it was not difficult to find different ways of encouraging the children to speak. We hunted through the primary reading collection for books with interesting pictures to stimulate the children to talk about what they could see. Working with groups of four children at a time, we both insisted that each child had the opportunity to think and answer individually and with more than a one word answer. For those children who maybe struggled a little to understand what they were being asked to do, the others in the group were able to explain in Kinyarwanda and spur on their friends. We took to counting the words in the sentence offered, and then tried to encourage the child to add in adjectives and/or use a conjunction to make really long sentences. The children rose to the challenge! The game of “Who’s Who?” – where players must use a process of elimination to identify the person on the hidden card – proved to be very enjoyable. However, we had to build up slowly to playing the game as it was too complicated to explain the rules – and our Kinyarwanda is really not up to that! So “buhoro, buhoro”, which translates as “slowly by slowly”, we finally played the game. The children were delighted each time that the remaining card in front of them matched up to the hidden one. As if by magic! We set up a shop in one of the classrooms. When the children walked in and saw it they were so excited. Using (very un-Rwandan!) shopping lists, they played customer and then brought some great cultural touches to the scene as they played shopkeeper….including sleeping under the table while waiting for the customer to arrive. Phrases such as “Here you are!” were used over and over – in the shop and playing “Go Fish” and “Happy Families”. The Happy Family cards were great for playing a guessing game and then for playing a version of charades. We were thrilled with the confidence of the children as the month went by and with the learning that was taking place. Many of the youngsters were prone to put the adjective after the noun, so for example “I can see a house red”, which we think is a spin off from French being the national language prior to 2009. However, by the end of our group times they were saying “I can see a red house”. Progress was noted too regarding the use of “his” and “her”, “he” and “she”. In Kinyarwanda everyone is a “he” – interesting in itself – so the youngsters find this quite tricky to understand and use. Each child had had a total of 6 hours of spoken English during September with the sessions being daily. So we ran groups both morning and afternoon. You will remember that in Rwanda the primary schools do “double shifts”. The teachers work all day but the children attend either morning or afternoon, on a rota system. So when the children are not in school, our children have the option of coming to Meg Foundation for extra classes. 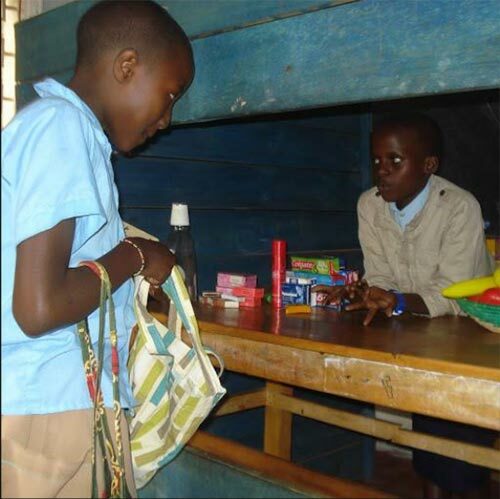 They are helped with their homework and with lessons to reinforce what they are studying in school. We noticed that the children who come to extra classes every day are making the best progress. It makes such a difference. And of course many come because they value the opportunity they have to learn. Other than the groups, we took part in the twice weekly music sessions to sing and make music with a lovely girl from Music without Borders. The cricket coach and the rugby coach come each week and lead sports sessions on the playground. 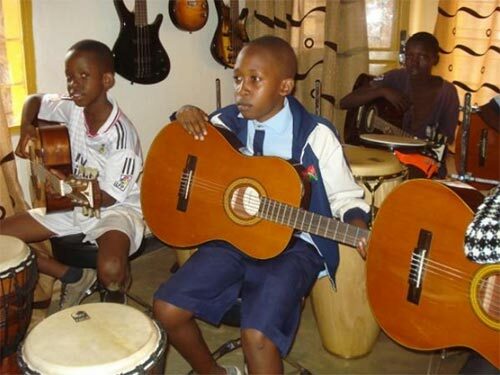 We accompanied some of the boys who attend Rwanda Rocks. This organisation offers free guitar lessons. We sat like proud parents, with eyes only for our boys from Meg Foundation. 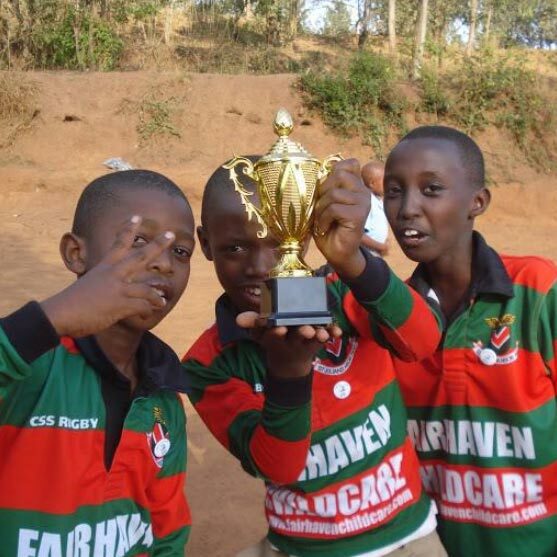 “Try for Peace” was the theme of the rugby tournament held within the school on Peace Day. Boy are those kids fast! 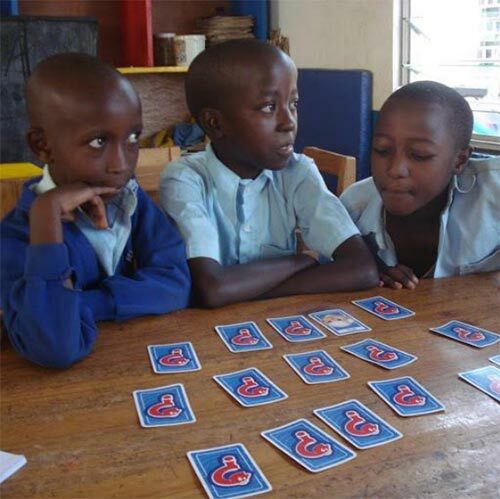 The International School of Kigali brings some students who play board games and speak English with the P2 children. 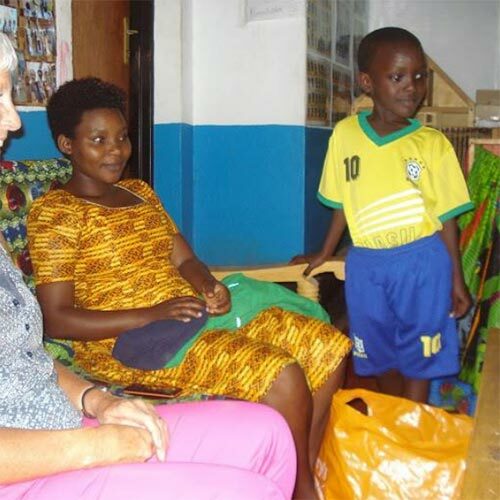 Meg Foundation loves to welcome visitors who enrich the lives of the children. Many of the children are sponsored and most sponsors will never meet the child they support. We feel very privileged to have met our little chap and his mother. We commissioned her to make outfits for each of the children in Nursery 1 Class. It was quite an experience to see all 41 of them in a line patiently waiting their turn for her to help them try on an outfit – a dress for the girls and top and trousers for the boys. Not mixing up all their yellow and blue school uniforms was a challenge! They were under strict instructions to keep their own gear tucked under their arms. They were all so pleased with their new outfits and went home wearing them proudly. We left them with a song new to them, “He’s got the whole world in his hands” which they learnt very quickly. 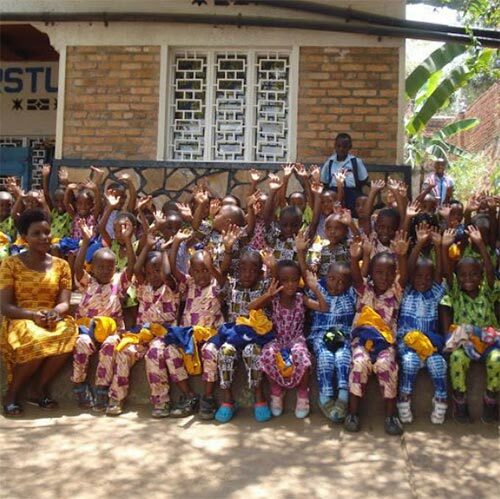 At Assembly time, the children love to sing songs in both English and Kinyarwanda- not at the same time. Their gift to us was to sing for us before we left, always very special and brings a lump to the throat. Thanks for allowing us to go to Meg Foundation again, we have returned all the richer for the experience.